Northeast Florida. That there is room to grow here with 6 million square feet of spec warehousing space projected for the next 5 years. That all of the pieces of the effciency puzzle are already in place – superior highway and rail con- nections, updated infrastructure, deep and experienced labor – and ready for the completion of our 47 foot harbor deepening project. 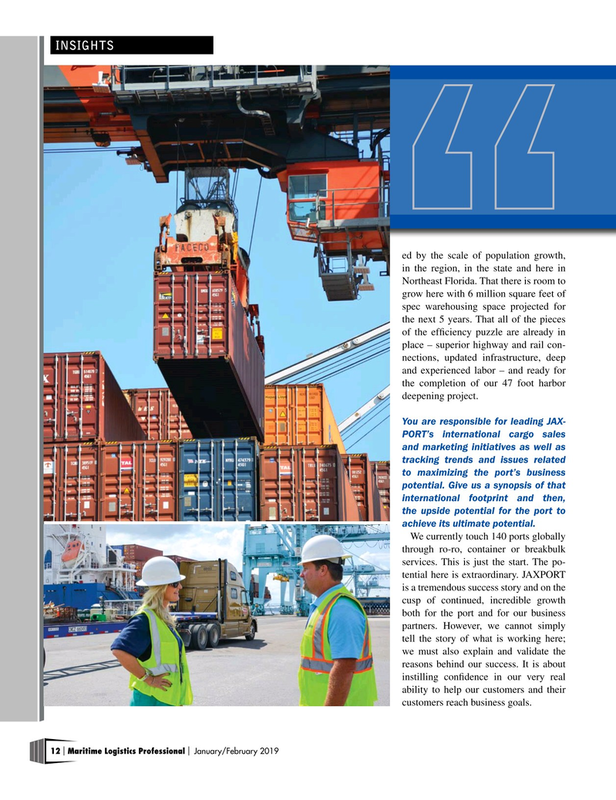 PORT’s international cargo sales and marketing initiatives as well as tracking trends and issues related to maximizing the port’s business potential. Give us a synopsis of that international footprint and then, the upside potential for the port to achieve its ultimate potential. We currently touch 140 ports globally through ro-ro, container or breakbulk services. This is just the start. The po- tential here is extraordinary. JAXPORT is a tremendous success story and on the cusp of continued, incredible growth both for the port and for our business partners. However, we cannot simply tell the story of what is working here; we must also explain and validate the reasons behind our success. It is about instilling confdence in our very real ability to help our customers and their customers reach business goals.